The 39 Roadster is a classic vintage styled car built by ACG that comes with a powerful AC motor and a SEVCON controller that allows it cruise with ease even at a top speed of 25 mph. The elegantly designed car has the perfect combination of comfort and luxury with a sturdy aluminium build and technologically advanced features. The 39 Roadster is truly made for the Royal Class. Also available as LSV/NEV with a top speed of 25 miles per hour, the 39 Roadster is the perfect Electric Vehicle to get you where you need to be. Whether you are going to the golf course, the market, or simply out to enjoy a beautiful day, the 39 Roadster is your elegant choice for affordable luxury. ACG, Inc. has revolutionized the Electric Vehicle Industry by re-inventing the increasingly popular Golf and Community Car platform from the ground up. The 39 Roadster was built with purpose and reliability in mind. Our dual purpose platform allows you to transform your 39 Roadster from a community vehicle to being the envy of everyone on the golf course with an easy to use hand- release golf bag attachment. 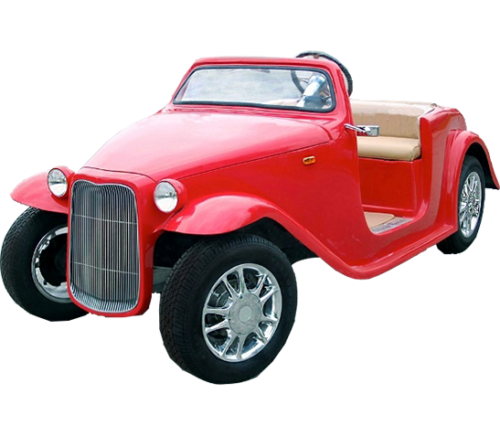 American Custom Golf Cars, Inc. has also certified the 39 Roadster with Federal Government (NHTSA/DOT) so that the 39 Roadster can be offered as a “Neighborhood Electric Vehicle” (NEV), which qualifies it for street use. The quality of the 39 Roadster begins in the engineering of the car from the ground up. The 39 Roadster is built using completely new parts. The frames are made from rugged and corrosion-proof all aluminum I-beams. The 39 Roadster uses a long lasting 48-volt system to ensure maximum range using industry leading Traction batteries managed by the SEVCON computerized controller. The Hi-output 17.5 peak horsepower AC motor is powerful enough to move you and your passengers at speeds up to 25 miles per hour and yet it is efficient enough to deliver a higher range than the industry average. The 39 Roadster also features an on-board 12-volt converter that gives you an in-dash power source to power you cell phone or laptop computer. For added safety, the 39 Roadster has been outfitted with standard headlights, brake lights, turn signals, horn and is the only golf cart to feature a standard 4-wheel braking system, which includes the use of front wheel hydraulic disk brakes. With all of the standard features that have been engineered into the 39 Roadster, ACG, Inc. has reset the bar in the Custom Electric Vehicle industry to a level that has never before been seen and that other companies can only hope to come close to. All 2015 Model Year ACG NEVs are now covered by exclusive 48-month / unlimited mileage Powertrain Warranty*. (* see Warranty Manual for details). The 39 Roadster is available with a multitude of options to increase your driving comfort and pleasure. It is available as a NEV Certified, licensable vehicle allowing it to be driven on city streets with a posted speed limit of 35 mph or less. It also has available leather interior upgrades, hidden AM/FM CD players, a hard top to protect you from the sun and even full multimedia systems that include DVD players and flip-down monitors. The 39 Roadster is also available with customized paint and graphic schemes to promote your company or just add that special personal touch to your vehicle. The California Roadster is a classic vintage style 2-seater automotive by ACG that comes with an extremely powerful 17.5 HP AC motor and six 8V batteries along with a SEVCON controller. This mighty yet elegant machine can reach a top speed of 25 mph and its front hydraulic disc brakes assure you of safety even when you’re breezing through town. The California Roadster is the perfect example of a car that does not compromise on style or luxury while providing the best technology available. 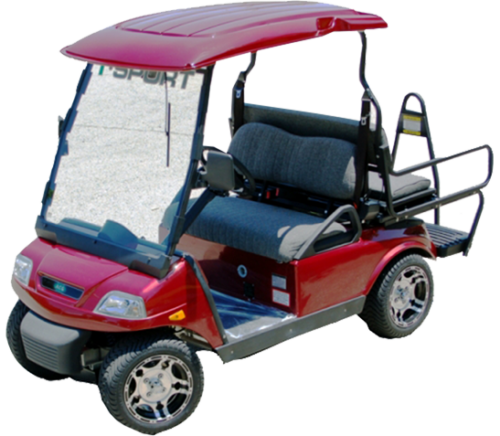 The T-Sport is a small yet sturdy golf car that is spacious enough to seat 4 passengers comfortably. Its powerful 17.5 peak HP AC motor allows it to reach speeds of 25 miles per hour and its SEVCON computerized controller provides easy manoeuvrability, whether you’re driving through the golf course or through the narrow city lanes. The stylish interiors, multiple upgrade options as well as the ruggedly attractive aluminium exterior make the T-Sport difficult to miss even as it cruises past you. 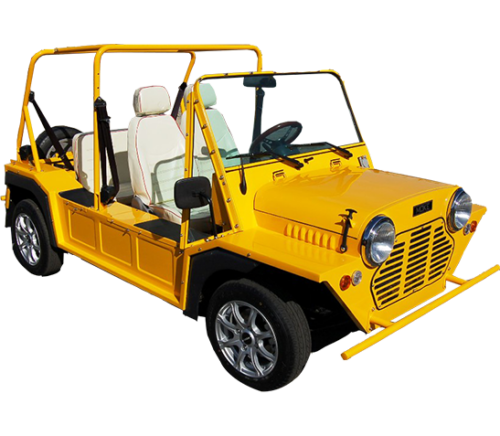 The Moke is a rugged, sturdy golf automotive that is built quite like a Jeep or a Gypsy. The Moke has a 17.5 HP AC motor that lets you drive around town with authority while its stylish lighting, vibrant colours and design will turn heads wherever you go, be it the golf course or the marketplace. The Moke has plush comfortable interiors and an excellent manoeuvring system that will make you want to keep driving all day long.